Eggplants love the grill, and I love to grill eggplants – or aubergines as they are so elegantly referred to in other countries. Eggplants comes in many sizes and shapes, while the most common variety is the plump, pear-shaped and, well, aubergine colored vegetable found year round in our markets. When it comes to the barbecue the versatile, yet subtle, eggplant is the workhorse of grilled vegetables. Its mellow, buttery flavor and firm texture lends well to the barbecue, as it hold its shape during grilling and serves as a perfect vehicle for spicy, smoky, flamboyant flavors. Eggplants may be simply prepared with olive oil, salt and pepper and served in stand-alone fashion – or tossed with a medley of Provençal-style vegetables as a grilled accompaniment to meat and fish. Cut in planks, and use as a vessel for a dollop of creamy tsatsiki for an easy crowd-friendly appetizer – or stack grilled slices with tomato, basil and goat cheese for an impressive beginning to a dinner. This recipe is easy to prepare, delicious and fresh to eat. The smoky eggplant combines beautifully with cool garlicky goat cheese, juicy sweet tomatoes and crisp fresh basil leaves. Serve as an elegant appetizer or on a bed of arugula for a dramatic salad. Preheat oven broiler or prepare grill. Lightly brush eggplant slices on both sides with olive oil. Sprinkle with salt and pepper. Arrrange on baking tray and broil in oven, turning once, until golden brown, about 3 minutes per side. (Or grill over direct medium heat until charred and tender, turning once, 6 to 8 minutes). Transfer to plate to cool. Whisk goat cheese, garlic, 1/2 teaspoon salt and 1/2 teaspoon black pepper in a small bowl. Arrange 1/2 of the eggplant slices on a platter. Spoon 1 to 2 teaspoons goat cheese over the eggplant, then top with 1 basil leaf. Place a tomato slice over the basil and spread 1 to 2 teaspoons goat cheese over the tomato. Place a second eggplant slice over the goat cheese. Top with one teaspoon goat cheese and basil leaf. 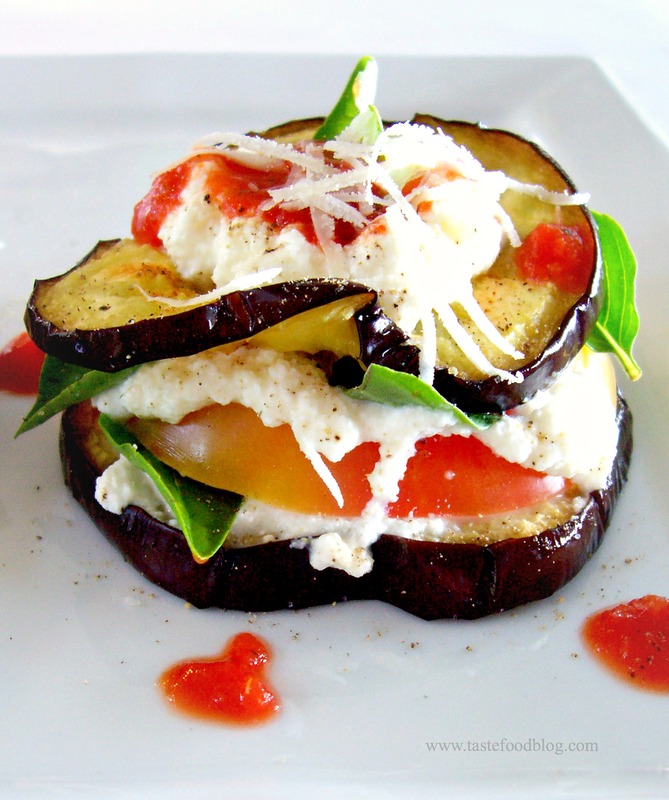 Lightly drizzle 2 to 3 teaspoons Tomato Coulis over and around the eggplant stack. Garnish with one teaspoon grated Pecorino Romano cheese. Serve immediately. Combine tomatoes, garlic and olive oil in bowl of food processor. Process until smooth. Add salt and pepper. Let stand at room temperature for one hour before serving. (Coulis may be made one day in advance. Cover and refrigerate). Serve at room temperature. Great recipe! This sounds like it would taste truly amazing. Bookmarking it right now. This looks like so good! I absolutely LOVE the word “aubergine”! So much so that when we lived in Rhode Island, we painted the front of our house that color with a dark green front door. The neighbors were skeptical of the color as it was being painted, but it was gorgeous, and they approved. I miss that house. We have a lot of “aubergines” growing in our garden, nearly ready for picking, so I am on the lookout for some recipes. I am excited about trying this one. And I’ll have my husband grill – I’ll do the assembly. You’re welcome! I still call eggplants aubergines. It sounds so much better. That must taste wonderful! 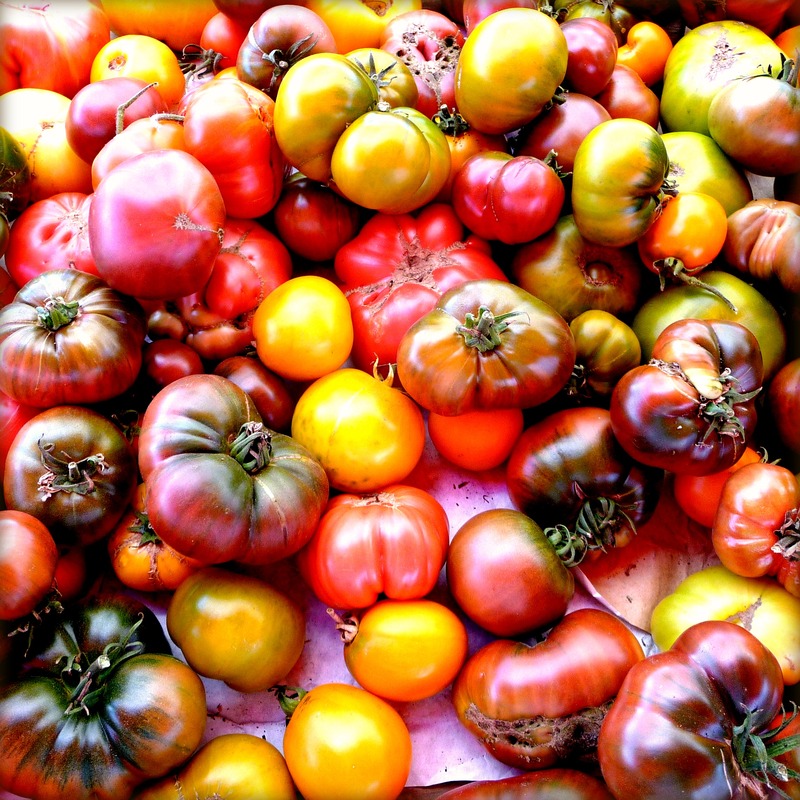 Heirloom tomatoes are divine and ever so pleasing to the eyes.